I have been honored by an invitation to be a participating artist in Gutai: Splendid Playground at Solomon R. Guggenheim Museum in New York, Feb 15 – May 8, 2013. For this exhibit I was asked to create 200 postcards for the Gutai Card Box, a recreation of the original performance in 1962. My response to this project was to make GUTAI REDUX, 8 self portraits appropriating art history that are in the playful Gutai spirit. 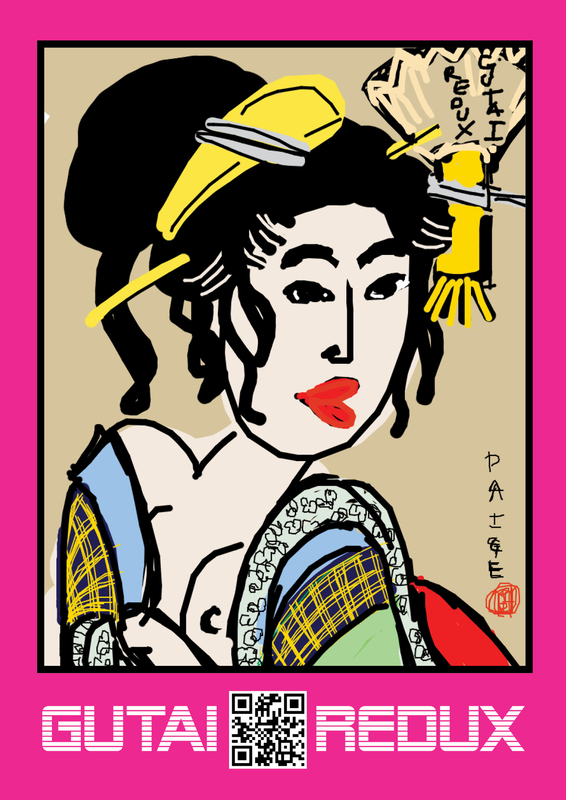 The cards I created are Digital Trading Card Stickers. 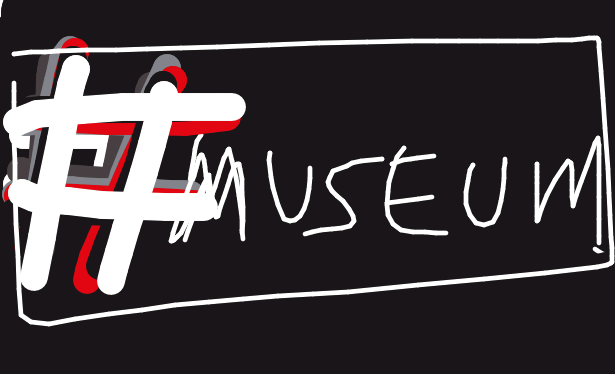 They were drawn on my iPad in the #DrawArt program I helped create for museum engagement. Each card has a QR code directing museum visitors who receive a card or others who see the stickers plastered on the streets, subways and signs of NY to a video on YouTube. The video allows you to “collect them all”.. and watch & learn more about Gutai art! If you want a Digital Trading Card Sticker in the mail just send me your address! Hey GenX Says bloggers! Summers hot and working in a museum is an ideal thing! However, I jumped right into the heat with a new world-view. It’s only a bit over a month since I stopped working at the museum and I have been focused on going forward with my goals. I just feel stronger each day that I made the right choice, the girl working teaching kids in the park or inventorying the galleries or main storage will not become a founding museum director of a digitally driven Jewish museum in the future without taking huge risks and going forward!! A friend of mine’s brother wrote a poem she read me 20-something years ago when this guy was fifteen how he’s “just a kid- so dont kid with me”. I remember then thinking “yeah no kidding..” — I knew that feeling of wanting to be leveled with or left alone. Those were those dark Bush I (Gulf War, Bosnia/Serbia and Rodney King days). Kinda grim and serious.. an angsty voice of ’90s teen-hell mixed with that certain alienated and withdrawn art-school mentality..
Today I feel differently! Kid, your voice is important and you got a place! Lets look at what kids do & how they kid around! Kidding around more would be good for all of us! We’ve been so darn serious for so long with politics, social issues, economic and global instabilities- ick!! I want to look at what kids make and think! They’re the future! They are the way out of the heavy rhythm of the past and full of bright potential. However, I feel that if they have old soggy models to look at then their fresh thinking and progressive ways may become diluted. As a GenX person it feels like its my place to make an intervention in a way- to step in and say hey, lets all go down a better path (because this one that I’m on has been kinda a tough one).. I think thats the Pay it Forward idea or “let me mentor you now while Im still learning and working on climbing this ladder, so your ladder is not full of barbs and rungs taken out from under you” – or simply the right think to do!! Mentor a kid now so its a better next generation with greater opportunities and achievements. Way more of us need to do this so that we can break the mold and push for stronger innovations. Why do I think innovations are so important? Because things are simply not good enough- I know this because I’m a GenX museum professional sitting here blogging at 4:30am full of great ideas!! So a month ago I was in the art supply store and a kid a bit older then my own son had a fist full of paint markers (which I like and buy my son who has ever color Sharpie and paint marker).. I asked him what colors or something about his markers and he said he was using them for shoes he designed. I had just that week donated my first object to a museum! A pair of hand painted graffiti boots that were so cool, a few years ago when I wore them to the Goldstein Museum of Design the Curator asked me for them one day..which became my first gift to a museum. My son has also designed some shoes that he’s drawn on paper so I got excited and asked him if he wanted to be a shoe designer. He replied that he wished to be a game designer but his Mom told him to enter every contest and his shoe design was for one. I had just that week applied for the NARS Curator of the Year and feeling just as on a wing but the most innocent best intentions and honest belief I could win feeling that I recognized in his eyes. I handed him my card and said I’m about to be a Phd student and I will need a game designer. 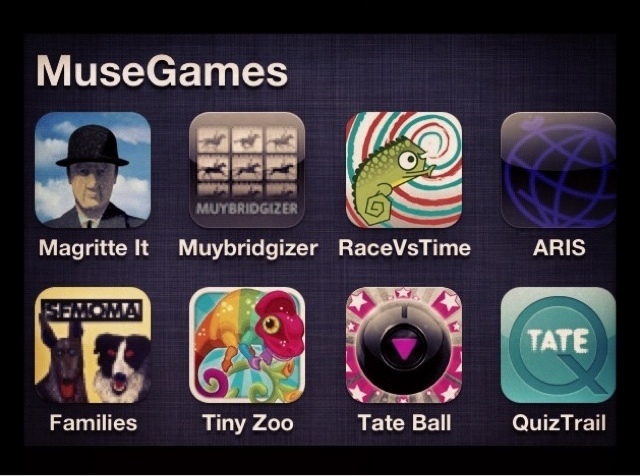 I am an art historian who specializes in Jewish art and my goal is to make iPad/mobile apps that include games. I asked if he wanted to “intern” with me and I’d mentor him while I was getting my Phd and that mentorship will be part of my methodology. He was super excited! I said I couldn’t pay him (hopefully that may change) but it would look good on his resume and help him hopefully in the future. We agreed I’d connect with his Mom and get this ball rolling! I told him there were museum games that are fun, challenging, rewarding, educational.. some games to be like games- and some apps with elegant functions full of interactivity and participatory game-like functions..learning comes in many forms as do games and that some were more successful then others for different reasons I explained over some emails.. I suggested some apps and games to check out on his computer (shucks, he doesn’t have a smartphone). Over the weeks he continued his interest and contacted me with ideas and questions about what I may want from him. I told him to trust me, I want lots of things but lets just first meet at a table at the museum and play with some games on my iPad and look at some art. We met up yesterday at @artsmia and sat in their new Commons Area, a hall with conference or work tables and lots of seating areas with outlets etc.. We explored many museum games on apps and I went on an hour brainstorm with him just taking it all in.. I discussed themes and ideas for Jewish games and told him that even a game like “Polish the Holiday Silver” or “Dress the Torah” don’t have to be completely unexciting but games like “Protect the Cultural Property” or “Recover the Nazi-looted Art” in a game called “Restitution” may be more exciting (and more relevant).. and very Indiana Jones-y! We discussed the idea of safe polite apps and some more risky ones such as how to really handle Nazi looting and how even a restitution mock-trial can be a game. Or a “Holocaust Memory Game” where artworks from the Holocaust could be used as a memory/match game.. It’s pushing some uncomfortable boundaries but I believe may be more effective then “Polish the Holiday Silver” which both the intern teen and my own kid groaned and assured me they’d rather try Nazis and return the art then see an etrog box or a pair of candlesticks polish-up!!! I agree!!! So the meeting wrapped up great with both of us going our ways to brainstorm more.. I taught him an exorcize I liked to teach the Art-in-the-Park kids I used to teach for the museum… I asked him if he ever hears a little voice inside that says “I can’t do this, it doesn’t look right, this doesn’t make sense..etc.” he agreed that he hears that sometimes. I told him this is the Voice of Censorship and everyone gets it sometimes.. Whether you’re 8, 18, 28 or 48 this voice is no good. I had him close his eyes and reach inside and visualize pulling that voice out of him, crumpling it up & tossing it out! We will see how that works… stay tuned this is a game in the works! btw: neither of us won the contests we entered for shoe design or curator of the year.. but we both agreed we felt like winners for applying! I just have a quick minute to write. I have to quick get ready for my 12 year old’s graduation from Hebrew School. I drove him twice a week for the last many years and not sure he really got anything out of it to be honest… Obviously I don’t need to tell you how uninspiring Hebrew School is.. However, if his classes were taught on iPads with games full of incentives to learn to make better choices, not repeat history, give back and think more selflessly then perhaps Jewish art history may be a perfect agent for teaching with social consciousness. Imagine Games Like: Recover the 14thC Treasure Trove from the Plague Riots, Uncover the Roman Mosaic, Find the Nazi Looted Art, Protect the Cultural Property, Holocaust Memory Game, Shine the Holiday Silver.. its endless how many ways to engage people through games. I know that tonight every kid graduating Hebrew School would have a deeper sense of identity and commitment to their cultural community if they all had iPads with Jewish art history games on them..But even greater then the kids liking Hebrew School, perhaps Jewish art history games could contribute to preventing a future genocide.